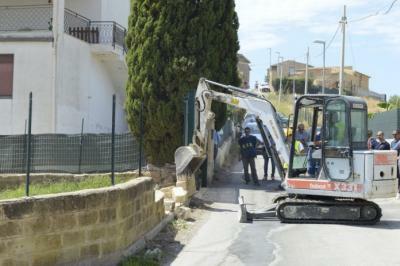 AGRIGENTO — Bulldozers have started to demolish a small house inhabited by a family of 5 persons in via Savarese, Maddalusa at the cost of €5,000. Following a day off, to remove sheets of asbestos from the roof, the company from Palma di Montechiaro, which won the contract of demolishing the eight buildings in zone “A”, has recommenced work. On Monday, after hours of protests, the verandah of 24 metres squared was demolished. There are no longer any protests. Rather, there are 50 people in the vicinity of the house, but the police has prohibited them from advancing into via Elio Vittorini, which is several metres from the property being demolished. “Agrigento is in mourning about what is happening to the Piraneo family. All of Agrigento is in mourning about the crimes of the State, which should protect their citizens, yet in this case, is mistreating them.” shouted an elderly inhabitant of Agrigento, holding the Italian flag in his hands. The demolition is taking place less than five kilometres away from the UNESCO World Heritage site, Valley of the Temples, which is the largest archaeological site in the world at 1,300 hectares. It is not only one of the main attraction of Sicily, but also a national monument of Italy.